The 20-year-old striker claimed his tenth goal of the season, firing Hibs into a two-goal lead at Stark’s Park after John McGinn had stunned Ray McKinnon’s players with a fourth-minute thunderbolt. 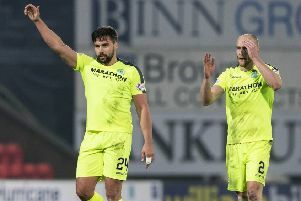 And, although Rovers pulled one back through veteran hitman Jon Daly, Hibs held on despite the game being extended by nine minutes by referee George Salmond after Raith substitute Craig Wighton had been stretchered from the pitch with suspected cruciate ligament damage. But, having also ended Falkirk’s unbeaten home run a few days earlier, Cummings insisted he and his team-mates go into Sunday’s match brimming with confidence and will be gunning for another victory. And, in securing hard-fought wins over Falkirk and Raith, Cummings believes he and his team-mates can cope with Mark Warburton’s free-scoring Rangers – sitting eight points clear at the top – insisting Hibs are now a better team than the one which pipped the Glasgow club to second place last season. He said: “It’s been a hard couple of games but we have shown that we have a defence that can handle pressure. Falkirk and Raith are really tough places, so to come away with maximum points is massive. We’re definitely a much better team this season. Our defence has been different class and deal with everything. That helps me a lot as a striker, when I know we won’t be conceding many goals. But, while he’s backing Hibs’ defenders to shut out Rangers, Cummings insisted he’ll be looking to add to his already impressive goalscoring record. He said: “That’s ten for the season and my target was to get ten goals before Christmas and 20-plus for the season, so I’m well ahead of schedule.